Read this post to learn how to choose footwear for bunions to reduce pain, increase comfort and improve your quality of life. If you have bunions, you already know that certain shoes just don’t work for you. Shoes that don’t fit properly cause pain and irritation throughout the day, which can carry over into the night! Poorly-fitted shoes without minimal support can make it difficult to walk, run or enjoy daily activities. The good news is that you can significantly improve your comfort level just by wearing the right footwear. In fact, there are five things that you can do now to reduce the pain associated with bunions. You just need to know what to look for and more importantly, what to avoid! Overpronation can produce bunions. But often a bunion results from wearing poorly-fitted shoes. Tight-fitting footwear, especially the pointed-toe variety, puts pressure on the joint connected to the big toe. 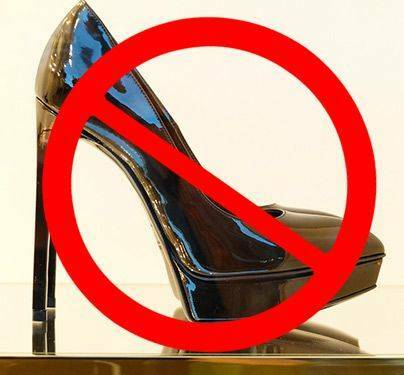 Add a high heel to the mix and gravity forces even more pressure to the forefoot. This excessive pressure pushes the joint out and stretches the joint capsule, causing a bunion. And once formed, only a surgeon can remove bunions. Get shoes that fit properly! Shoes that fit well can help you avoid many foot problems–even bunions! Make an appointment today for a FREE foot analysis! A trained pedorthist will analyze and measure your feet to determine the best footwear for your individual needs. Contact us today! Fortunately, the right shoes, arch supports and/or custom orthotics can keep you more comfortable without going under the knife. So how do you find the right shoes and/or orthotics? 1. Choose shoes made with a wide toe box. Shoes with wider toe boxes simply provide enough room to accommodate bunions. A wide toe box can significantly improve comfort. It minimizes pain that often accompanies tighter-fitting shoes or shoes with narrow toe boxes. 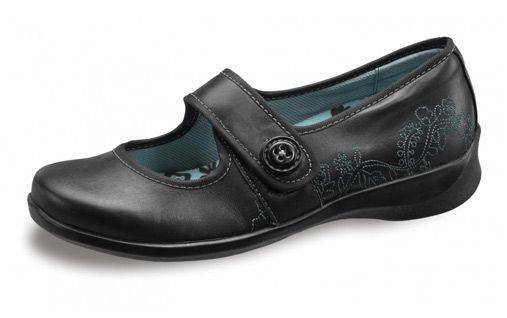 Examples of comfort shoes with wide toe boxes include Aetrex’s Lucy or Aravon’s Maya, both excellent choices. They come in a variety of sizes and widths to fit almost any foot. 2. Opt for shoes made from flexible, soft materials that won’t irritate bunions. Flexible materials stretch to accommodate bunions while softer materials work to keep skin feeling comfortable. Look for shoes with both to help reduce pain and skin irritation. A great example is Aetrex’s Helen. It offers a stretchable, spandex upper. Supple materials and a roomy toe box work together to help you stay comfortable all day. A strap closure provides an adjustable fit while dual removable insoles allow for adjustable depth. Another great example is the knitted upper on the Arcopedico LS. 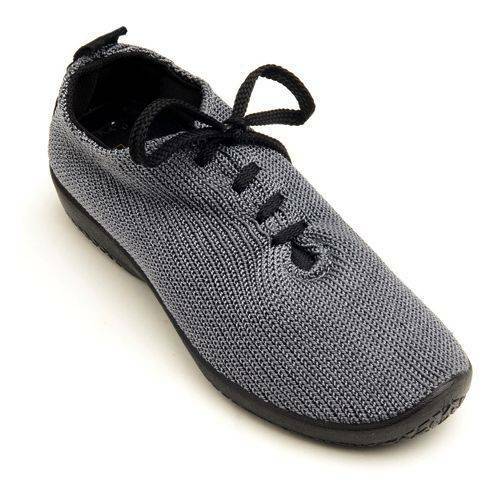 This knitted upper material conforms around the foot, accommodating bunions. 3. Choose footwear that controls pronation to improve bunions. Though bunions often stem from tight, ill-fitting shoes, overpronation remains a major cause. So if your bunions resulted from overpronation, it’s important to buy shoes that help to control it. Shoes that offer motion control and arch supports work best. 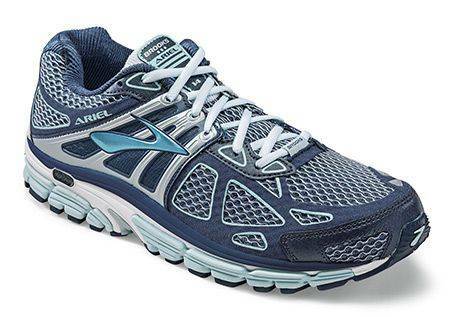 Motion-control athletic shoes such as the Brooks Ariel are great for bunions. They provide motion control for a smoother gait while a stability shank supports the midfoot. 4. Get arch supports or custom orthotics to help relieve pain from bunions. Arch supports and custom orthotics help improve shock absorption and distribute pressure evenly over the entire foot. They work to control pronation, which helps to reduce pain and pressure on bunions. Arch supports and orthotics fit easily into most footwear. And many comfort shoes come with removable footbeds to accommodate custom orthotics and arch supports. Interested in arch supports or custom orthotics? Make an appointment today for a FREE foot analysis! We can show you which arch supports work best for your foot type or fit you for custom orthotics to help with bunions and other foot conditions. 5. Get shoe modifications to accommodate bunions. It’s a quick and easy process that can give you immediate relief from the pain and irritation of bunions. * Please note that only leather shoes may be stretched; shoes made of synthetic materials cannot be stretched. Stop by your nearest Lucky Feet Shoes store today! One of our trained pedorthists can help you choose shoes, boots, sandals and other footwear to help relieve your pain and improve your quality of life. The fact is we’ve helped thousands of our customers do just that! So come in today! We carry a complete line of comfort shoes, wide shoes, walking shoes, running shoes, heels and more! You’ll find our stores in Anaheim Hills, Rancho Cucamonga, Riverside, San Dimas and Temecula. Don’t forget to ask about our FREE foot analysis! If you’d rather shop online, you can see our complete line of shoes for bunions here.